In this research, we observed the user’s posture while using PDA. 30 participants typed the keys with standard QWERTY keyboard on the PDA. At the end of the experiments the participants who have professional background in design were asked to complete an open-ended questionnaire, which is in order to evaluate the usability of the PDA. In the final, we presented the suggestion of design criterion for keyboard, as to provide the references for future PDA design. The statistical result of the posture while using the PDA revealed that the most users held PDA with both hands and pressed keys with both thumbs. 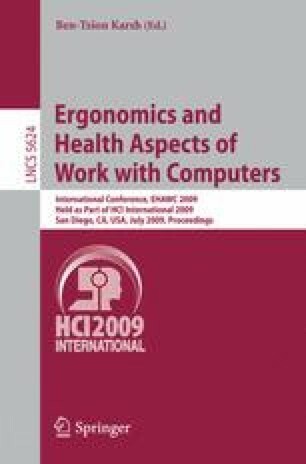 The findings in this research suggest that when we design small input devices such as PDA in the future, the stability of the keyboard usage should be taken into considerations to enhance its input performance and improve user experience.